Retro Trend Vintage: Popsicles are G+reat! It's hot outside. And humid. Even my pooches are miserable during our short, sauna- esque walks. Unrelenting heat of this type calls for evasive action- not just cocktails, but popsicles. 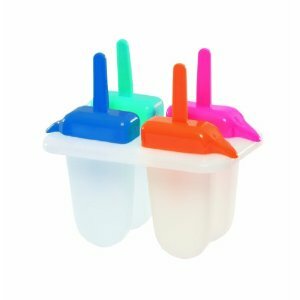 And since I'm probably the only person who never made popsicles from scratch, a mold was purchased. 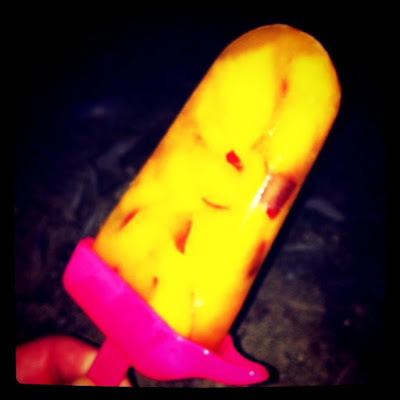 Shown above is my first attempt, chopped nectarine and orange juice pops. They are now gone. The newfangled Zoku is shiny, but I decided to start with this simple mold instead (which I purchased at Target for $3.99, but it isn't on their website). The second batch of pops (Latin strawberry puree from a local Korean grocer and a bit of Greek yogurt for smoothness) are also amazing. Only a couple of more to consume until the next round- possibly mango and Thai chilies. Or Watermelon with mint. Or blackberries and raspberries with basil. Perhaps adult versions should be next, with a bit of vodka. Or gin. And, yes, I know how to spell "great". For those who have been hiding under a rock, the G+ refers to Google+, touted as "The Facebook Killer" as well as a nearly all- male social network, the invite only (for now) media vortex feels like an interesting mix between Facebook and Twitter, which I do like. So there, a female user with a mostly female circle (group of people you interact with) who is still on both Facebook and Twitter. Since Google+ isn't allowing many business pages right now as the format is still in Beta- or if you've ever wondered how the mind behind Retro Trend Vintage works- you can find my personal page here. I won't bite. While we're getting acquainted, here's my personal Twitter account. Enough rambling for now- enjoy your weekend!